safe to cast a heal or that Blessing of Freedom is going to be back up for an enemy Paladin soon. If you want to know the cool down of an obscure ability say Whirlwind then this is not the mod for you. New timers for abilities that are not included by default can easily be added under the configuration. However, the system is flexible enough that any enemy timer can be added including traps or totems. Alerts for when a spell is triggered (or ends), as well as when you interrupt or dispel an enemy are included. 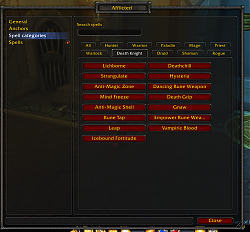 All alerts can be shown inside party, raid, raid warning, combat text or a specified chat frame. *Reworked some spell code to remove any spells in the spell list without an actual spell in game associated with it. 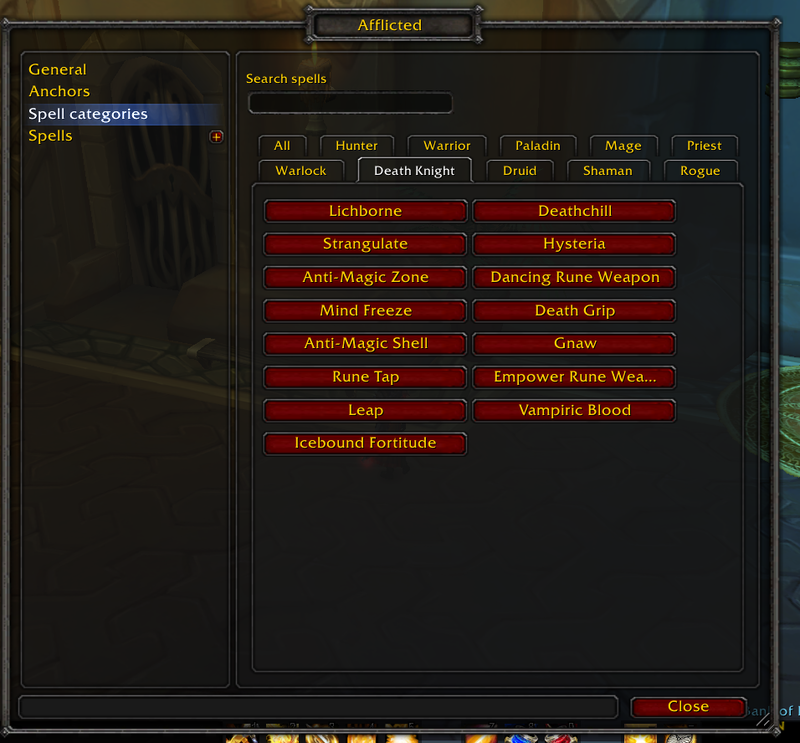 This will remove custom added spells that no longer exist in WoD. You shouldn't see any more #XXXXX or similar spells at the top of your spell list. *Removed spells from the spell list that no longer exist, changed the cooldown for a few others, and upped the spells version number to 14. I anticipate having more spells to add as time goes on (or requests are made) as I didn't take the 20 hours it would take to go through every class and spec and see what new toys they got for WoD. *Updated wowace libraries to the newest available. Set arena to default to 3v3 for now since there's not a super-reliable way to predict arena team size that I've been able to test since the patch. This will fix the problem of the addon not working when in arenas. Added in code to merge in a proper anchor on spell database update to avoid future problems and properly updated spell database so that life cocoon and combat readiness will respond properly. Work around for error popping up due to combat readiness and life cocoon ending early and not being assigned to proper anchors. Fixed icons not fading when abilities fade early, also corrected for bars (though it was only a select few spells). Corrected an error in the GTB library that was causing icons to not display properly in bar mode. This was brought about by new functionality in the GetTexture API call. Testing during a single level 8X BG showed the proper icons for the abilities. 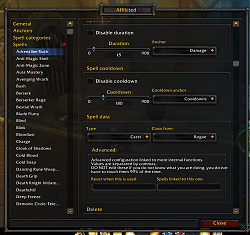 *Redone spells, might not have gotten all of them put in that people may want, but the durations and CDs, as well as spells new to Cata (like rebuke and skull bash) have been added into the default. -Note that this will not effect people who have already used that addon, as the spells list seems to be generated when the addon is first loaded, so if you want the new ones, you'll have to delete the addon under the WTF saved variables folder. You can also add them in yourself. 1x [ADDON_ACTION_BLOCKED] AddOn 'Afflicted' tried to call the protected function 'BFConfigPage:SetParent()'. I'm having problem with warlock-interrupts. Spell lock and Grimoire:Felhunter doesnt work. Tried adding them from spell ID but nothing. Also with hunter freezing trap. If anyone got some modified version that works well please PM me. Instead of asking for a "modified version" just post here that you're having an issue (or send me a PM) and I can look into it. It's not like this addon hasn't been updated in years or anything. I check every few weeks incase there's an issue. You're having problems with spell lock because blizzard re-introduced separate spell IDs for the same ability. Also, the terrorguard spell lock is a different ability. You're having issues with the freezing trap because the freezing trap that gets fired from the trap launcher has a different spell ID than the base freezing trap. I've added these abilities to the new version I'll be releasing soon. 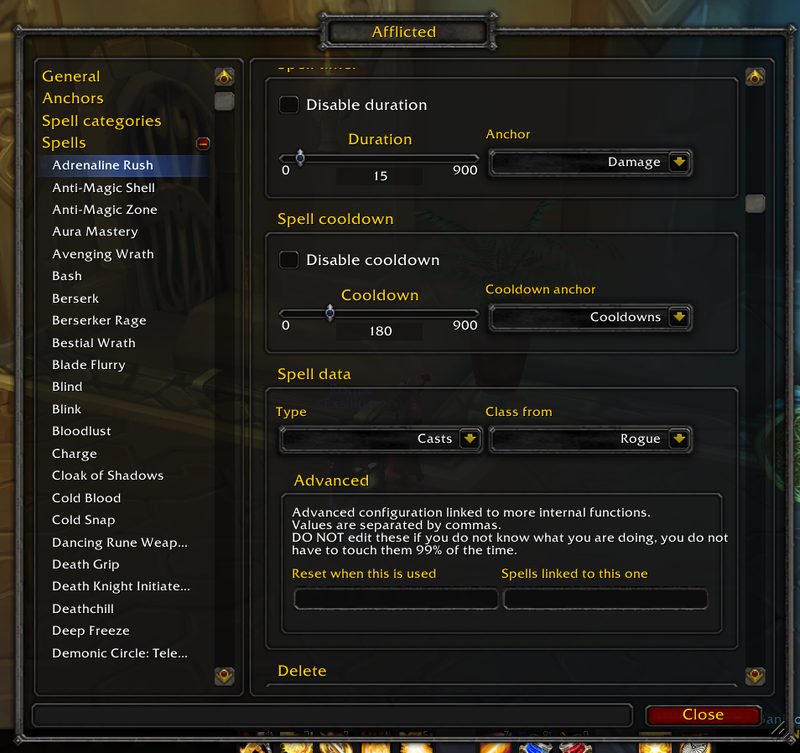 It's nice to have Afflicted fixed and updated for the upcoming 6.0 patch. Would be nice to have Afflicted fixed and updated for the upcoming 5.2 patch. Last edited by Deadlyz : 01-31-13 at 11:02 AM. spellName = "Wrath of Air Totem"
Guys , why shadowed dont continue working on this addon and update afflicted for 4.1 patch, i am confused? I try to contact him via private message system, but he don't answer me. Last edited by Fujosej : 05-20-11 at 06:06 PM. Thank you to themagician, holy crap you are a LIFESAVER. I WILL SRSLY DONATE! AFFLICTED WORKS IN 4.1! Yes this works and its safe. Since the UI doesnt work, you can edit the Afflicted.lua in \WTF\Account\YOURNAME\SavedVariables. The last line states "["showAnchors"] = false,". Set it to true is you want to see the anchors again when you login.